* The due date is May 1: "House Judiciary Committee Chairman Jerrold Nadler, D-N.Y., on Friday subpoenaed the Justice Department for the full, unredacted version of special counsel Robert Mueller's report as well as the underlying evidence." * An important detail: "Special counsel Robert Mueller's criminal investigation may be over, but the FBI's efforts to assess and counter Russian efforts to influence the U.S. political system -- including the Trump administration -- is continuing, current and former U.S. officials say." * Ohio: "A federal judge blocked part of an Ohio law late Thursday that bans the abortion method of dilation and evacuation in most cases, adding to a list of restrictions on the procedure that are or soon could be in legal limbo." * Remember him? "Scott Pruitt, the scandal-ridden former head of the Environmental Protection Agency, registered as an energy lobbyist in Indiana on Thursday as fossil-fuels interests there are fighting to block the proposed closure of several coal-fired power plants." * Virginia: "Two Virginia police officers who worked for different agencies were fired this week after an anti-fascist group linked them to white nationalist organizations." * South Florida: "Federal authorities today announced that John Kless, a 49-year-old resident of Tamarac in Broward County, called three Democrats at their Washington, D.C. offices April 16 and left voicemail messages threatening murder. The lawmakers included California Congressman Eric Swalwell, Detroit Congresswoman Rashida Tlaib, and New Jersey Sen. Cory Booker." Donald Trump didn't have a whole lot to say about Special Counsel Robert Mueller's report yesterday afternoon, though the president did get around to sharing a predictable thought via Twitter: he blamed his predecessor. "Anything the Russians did concerning the 2016 Election was done while Obama was President. He was told about it and did nothing! Most importantly, the vote was not affected." Nearly everything in Trump's tweet was wrong. The vote was affected. Barack Obama did a lot more than "nothing," and he would've done more were it not for Mitch McConnell's opposition. The "anything the Russians did..." suggests Trump may still have some doubts as to the nature of the Russians' attack, which is an issue that does not lend itself to skepticism. But routine nonsense is less interesting to me than Trump's ongoing preoccupation with the president who preceded him. I thought it was at least possible that the Republican, in time, would stop obsessing over the recent past, but by some measures, Trump fixates on Obama nearly as much as Hillary Clinton. Yesterday, for example, Trump blamed Obama for the Russia attack. Earlier this week, Trump made up a story about hearing from a "big tough guy" who was "crying" because Obama ruined his life. Last week, Trump focused his attention on his approval rating -- as compared to Obama's. Earlier that day, Trump tried to defend his family-separation policy by falsely claiming it was actually Obama's policy. Four days earlier, Trump went after Joe Biden by condemning Obama. Three days earlier, Trump told the National Republican Congressional Committee, "By the way, the carbon and all of the things flying up in the air, you know, the carbon footprint? President Obama used to talk about the carbon footprint and he'd hop on Air Force One, a big 747 with very old engines, and he'd fly to Hawaii to play a round of golf. Now, you tell me, the carbon footprint. But that's the way it is." Obama, incidentally, never flew to Hawaii solely to play a round of golf. During Congress' lame-duck session in 1998, just a week before Christmas, the Republican-led House impeached then-President Bill Clinton. Among the serious allegations against the Democrat were claims that Clinton encouraged and permitted others to lie on his behalf. As the legal/political process unfolded, GOP members from the House Judiciary Committee became impeachment "managers," tasked with making their case to the Senate and asking senators to remove the sitting president from office. But as part of those same efforts, those Republicans also did their best to persuade the public that their cause was just. In fact, as MSNBC's Chris Hayes noted on his show last night, a young GOP congressman from South Carolina named Lindsey Graham went on "Meet the Press" in January 1999 to argue that Clinton shouldn't get away with his alleged misdeeds. "[Clinton] doesn't have to say, 'Go lie for me,' to be a crime," Graham said at the time. "You don't have to say, 'Let's obstruct justice' for it to be a crime. You judge people on their conduct, not magic phrases." That sounds like a fairly reasonable posture. The trouble, of course, is that two decades have gone by, Graham is now a senator, and it's his ally in the White House who's facing credible allegations of lying, encouraging others to lie, and taking a series of other deliberate steps to undermine a federal investigation into alleged presidential misconduct. And how, pray tell, did the Republican lawmaker respond to the release of the Mueller report? Graham said in a statement that his panel is studying the report. The South Carolina Republican says he's eager to hear Barr's May 1 testimony to his panel. "Once again, I applaud Attorney General Barr for his commitment to transparency and keeping the American people informed," he wrote. Given Barr's political antics and deceptions, I'm not sure how the senator's praise makes sense, but for now, let's put that aside. Instead, let's ask a more pointed question: will 2019 Lindsey Graham apply 1999 Lindsey Graham's standards? Today's installment of campaign-related news items from across the country. * Former Vice President Joe Biden is reportedly prepared to launch his Democratic presidential campaign next week. * On a related note, former Virginia Gov. Terry McAuliffe (D) announced this week that he won't launch a White House campaign, and will instead focus on helping his party in state legislative races. * Sen. Bernie Sanders' (I-Vt.) presidential campaign launched a new fundraising drive this week, asking for contributions by pointing to his Democratic critics. There's some risk in this: the independent senator has already faced questions about his commitment to the party. 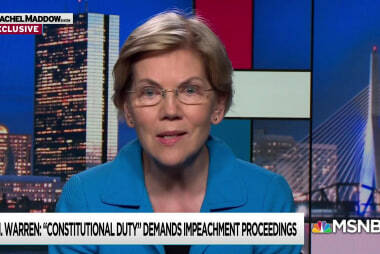 * At least for now, the Democratic presidential campaign with the largest staff operation belongs to Sen. Elizabeth Warren (D-Mass. ), who "now has a team of more than 170 people." * File this away for future reference: Donald Trump said yesterday he expects to be in office for another six years, and joked that he might remain for "at least for 10 or 14 years." * In West Virginia, Gov. Jim Justice, running as a Republican after getting elected as a Democrat, now has two primary rivals. Former state Del. Mike Folk (R) was already running, and this week, former West Virginia Commerce Secretary Woody Thrasher (R) threw his hat into the ring, too. A senior White House official told Olivia Nuzzi a couple of weeks ago, in reference to Special Counsel Robert Mueller's findings, "There will be plenty of unfavorable things about the president in the full report, which we think will eventually come out, so let's not go overboard saying there's no wrongdoing." That was a sensible perspective. It was also too late. 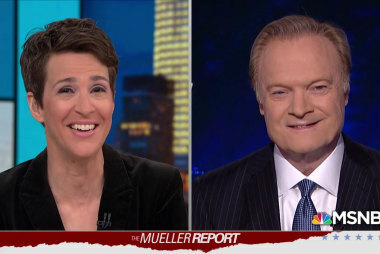 Donald Trump and his loyalists decided weeks ago that the Mueller report "could not have been better," and "totally exonerated" the president. It was a triumph for the ages, which humiliated the president's enemies, and transformed the president into a heroic figure. I'm reminded of a piece Ashley Parker wrote last week on the White House's over-the-top boasts about the report officials in the West Wing had not read. [W]hen the Justice Department releases Mueller's redacted report in coming days, the reality is likely to be far more nuanced -- including potentially damaging new details of alleged misdeeds by Trump or his campaign, even if they fall short of criminal wrongdoing. That puts the president and his defenders in a potentially thorny position: Could Trump's cries of "total exoneration" become his own "Mission Accomplished"? A week later, I think we have an answer. "Mission Accomplished," of course, was the text on the banner above George W. Bush in 2003 when the then-president declared the end of "major combat operations" in Iraq. Bush never literally spoke the words "mission accomplished" in his remarks, but they appeared over his head during the speech and his presidency was haunted by the phrase. As conditions in Iraq deteriorated, the death toll mounted, and the arguments in support of the invasion evaporated, that two-word banner came to represent premature celebration. It quickly became a warning to future presidents, tempted by hubris. As regular readers know, it's a lesson Trump refuses to learn -- as evidenced by his own "Mission Accomplished" moments in North Korea, Syria, and now the Russia scandal. "I'm having a good day, too. It was called, 'No collusion. No obstruction.' There never was, by the way, and there never will be." To the extent that reality has any meaning, the boast didn't make sense. The report, which Trump did not read, painted an incredibly damaging picture of a president who lied, encouraged others to lie, took repeated steps to undermine a federal investigation, and has overseen a dysfunctional and corrupt operation that had "numerous links" with Russian attackers who targeted our elections to put him in power. There was no reason to pretend this was "a good day." Kellyanne Conway, who somehow managed to keep a straight face, described the release of the devastating report as "really the best day since" Trump's election in 2016. The White House counselor added, "We're accepting apologies today, too, for anyone who feels the grace in offering them." Apologies for what, Conway didn't say. Perhaps it's supposed to be obvious that, in Trump World's bizarre alternate reality, the president should be seen as a victim. It's tempting to describe the Mueller report as a political Rorschach test, with different groups of people looking at the same image, but seeing entirely different things. There is, however, a problem with the analogy -- because one side of the argument needs people not to look at the inkblot at all. For nearly a month, much of the political world acted as if they knew all they needed to know about Special Counsel Robert Mueller's report -- not because they'd seen the document, but because they were willing to accept Attorney General Bill Barr's claims at face value. At one point, Senate Judiciary Committee Chairman Lindsey Graham (R-S.C.) suggested he wasn't eager to read the actual Mueller report, in part because his trust in Barr was so complete, and in part because he didn't share Democrats' "paranoia" surrounding the controversy. This was not an uncommon perspective. After the attorney general's original non-summary summary, the White House, Republicans, and even many in media acted as if the entire Russia scandal had instantly evaporated. Barr had exonerated Donald Trump, and it was incumbent upon all of us to simply accept that as fact. Before the special counsel's report on Russia and President Trump was released to the public, Attorney General William P. Barr made several statements about what was in its 448 pages. Barr received special counsel Robert S. Mueller III's report last month and outlined its principal conclusions in a letter dated March 24. Barr then held a news conference on Thursday, shortly before releasing a redacted version of Mueller's report. As it turns out, in some cases, Barr's characterizations were incomplete or misleading. Since yesterday afternoon, several outlets have published very compelling pieces, offering extensive details contrasting what the attorney general claimed and what turned out to be true. Each of these pieces paint a damning picture, and they're worth your time. But stepping back, I'm also interested in what happens now. For reasons that aren't yet clear, Attorney General Bill Barr assured the public yesterday morning that Donald Trump's White House "fully cooperated" with Special Counsel Robert Mueller's investigation. We soon after learned that the opposite is true, though even at the time, the claim didn't make a lot of sense. If the president was willing to "fully" cooperate, wouldn't he have agreed to answer investigators' questions? 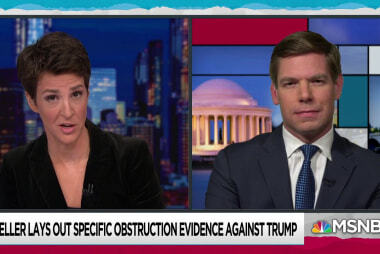 We learned in the Mueller report that investigators considered a subpoena to compel Trump to answer questions, but they ultimately passed, concluding that the legal fight would create excessive delays in the probe. The special counsel's office instead agreed to a written Q&A with the president. As the Washington Post noted, it didn't go especially well. They covered four primary topic areas: the Trump Tower meeting in June 2016, the Russian effort to interfere with the election, the proposed development project in Moscow and contacts with Russia or Russia-related issues during the campaign and transition. In total, the Mueller team asked 38 distinct questions with 37 follow-ups. Trump offered 22 distinct answers. In 19 of those answers, he claims not to remember or recall some particular issue. Often, those failures to remember what happened constitute the entirety of his response. Questions related to obstruction of justice weren't answered at all. The Mueller report noted, in reference to Trump's responses, "We viewed the written answers to be inadequate." Imagine that. But to appreciate what makes this even more amazing, it's worth revisiting how proud the president was in his answers. It's easy to forget that the Senate Intelligence Committee's investigation into the Russia scandal is ongoing. The probe doesn't generate a lot of attention or drama, but it's been quietly proceeding in the background, and it's likely the committee's members will eventually release some kind of report on their findings. But while we wait, there are some fresh questions surrounding the panel's Republican chairman, Sen. Richard Burr (R-N.C.). As NBC News reported yesterday, Special Counsel Robert Mueller's report noted that the senator apparently provided the White House with information on the Russia investigation after a private briefing with then-FBI Director James Comey. 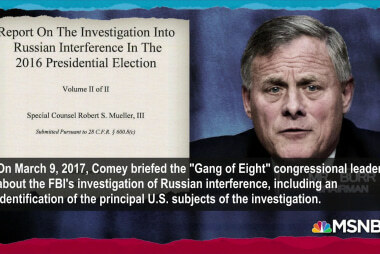 Within a week of Comey briefing the "Gang of Eight" congressional leaders about the FBI's Russia probe in March 2017, Mueller wrote that then-White House Counsel Donald McGahn's office was in contact with the North Carolina Republican "and appears to have received information about the status of the FBI investigation." As Mueller notes, it's unclear if Trump was aware of the briefing at the time. But Annie Donaldson, who served as McGahn's chief of staff, wrote then that "POTUS in panic/chaos ... Need binders to put in front of POTUS. 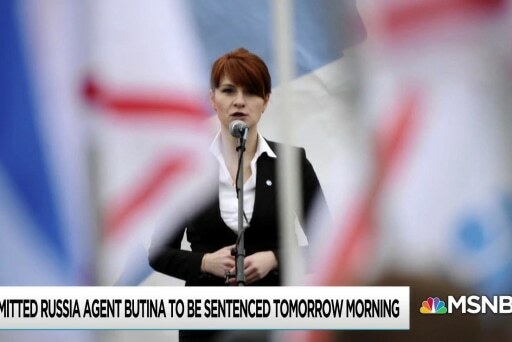 (1) All things related to Russia." According to Donaldson's notes, which Mueller referenced, McGahn's office was briefed by Burr "on the existence of '4-5 targets.'" It was not clear if Donaldson was present for that briefing, or was simply taking notes on something she had heard. A spokesperson for the North Carolinian said in a statement that Burr doesn't recall the conversation, adding, "[H]owever, any conversations between the two would have been in reference to the need for White House personnel to voluntarily comply with the Senate Intelligence Committee's Russia investigation. If specific individuals were discussed, they would have been those known to the Committee, the White House, and the media. The Chairman's stewardship over the Committee's bipartisan and fact-based investigation over the last two years speaks for itself." White House Press Secretary Sarah Huckabee Sanders has been caught saying untrue things many times, but she's often relied on a convenient excuse. "We give the best information that we have at the time," has long been a go-to line for Donald Trump's chief spokesperson. The subtext, which has never been especially subtle, has always been that Sanders doesn't necessarily lie, so much as she's lied to. When the White House press secretary passes along information that proves to be false, it's not her fault if she's merely a conduit for others' falsehoods. This defense won't help Sanders when responding to her latest mess. On May 10, 2017, Sarah Sanders, then the White House deputy press secretary, told reporters that "countless" FBI agents had told the White House that they had lost confidence in James Comey, who had been fired as FBI director the day before by President Donald Trump. But special counsel Robert Mueller's report, released Thursday, says that she simply made the assertion up. The report says Sanders, since promoted to press secretary, told investigators she had no evidence to make that claim. 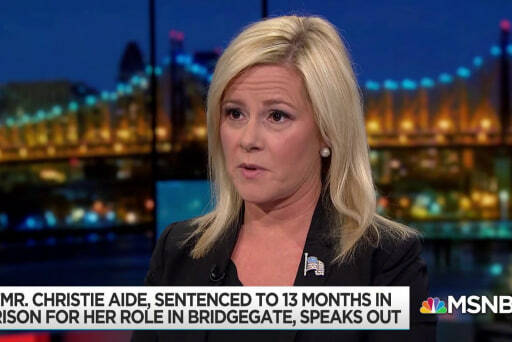 It was not the only example of the Mueller report shining a light on deceptions from one of Trump's press secretaries, but it was the most dramatic instance -- in large part because Sanders effectively admitted to investigators that she made up her claim. The presidential spokesperson would probably face an unpleasant grilling if she still hosted routine press briefings, but instead, Sanders turned to Fox News' Sean Hannity last night and said she had "a slip of the tongue." As a rule, that's reserved for routine slip-ups, such as saying "Iran" when one meant to say "Iraq." Making up conversations with FBI officials, in order to justify the improper firing of an FBI director, is generally something altogether different. The New York Times published an interesting overview of Special Counsel Robert Mueller's report, which included a notable challenge to readers: "Imagine reading this report cold." Prosecutors describe a president who was preoccupied with ending a federal investigation, a White House that repeatedly told misleading and changing stories, and a presidential campaign that was in repeated contact with Russian officials for reasons that are not always clear. Even though prosecutors concluded that didn't amount to provably criminal conduct, the report is astounding in its sweep. Yet it is also a reminder of how much the public has learned over the past two years about Mr. Trump's conduct. If the American public or members of Congress were learning these things for the first time, the political fallout would normally be devastating. The consequences of the report remain to be seen, but if people are not surprised or shocked by the revelations, then Mr. Trump may have benefited by the steady drip of news stories he has so loudly criticized. It brings us back to the cruel fable about boiling a frog, which came to the fore shortly after Mueller first submitted his findings to Attorney General Bill Barr. The idea, as regular readers may recall, is straightforward: if someone were to throw a live frog into a pot of boiling water, the shock would be immediate and the frog would leap out. But if the frog is placed in tepid water, and the temperature increased gradually, the frog would slowly acclimate to the hotter temperatures -- until it's too late. Putting aside whether the fable is true, it offers some parallels to the revelations surrounding the Russia scandal. Reading the Mueller report yesterday, some of the disclosures were familiar because we'd learned of them before, by way of investigative reporting from major news organizations. Despite the recent wave of condemnations about "the media" getting the Russia scandal wrong, journalists actually got nearly all of the story right. Coverage the White House condemned as "fake news" has since been corroborated. For Donald Trump and his followers, the fact that the special counsel didn't indict the president effectively ends the conversation. The scandal was a mirage, they say, and those who took it seriously fell for a "hoax." To believe this is plainly absurd, but it's also evidence of people who've chosen to play the role of the frog. 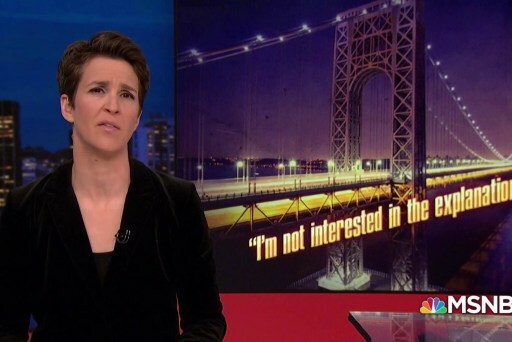 Meme check: Did Rachel really say that? Where can you get one of those TRMS mugs?